Winding down 2016 also means that National Parks at Night is winding down its first year. (Which seems odd, because we're already working on our third year.) Part of that winding down was running our final two workshops of 2016, at Arches National Park in Utah and Death Valley National Park in California. Both workshops were a lot of fun and productive, with pristine night skies and beautiful scenery. Check out below for some details. Fifteen creative souls joined Tim Cooper and I in Utah at Arches National Park. 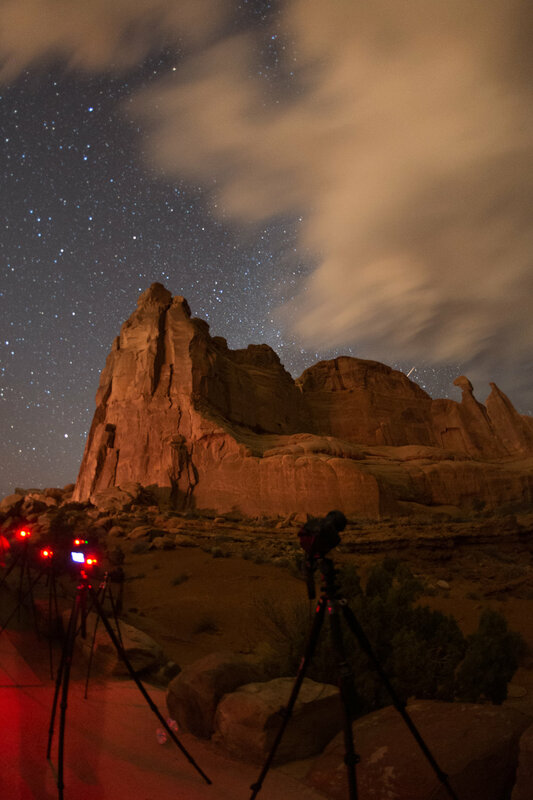 With experience levels ranging from first-time night photography shooters to advanced artisans of the night, they all tackled the iconic Arches landscapes with enthusiasm and great cheer. The workshop started directly after the supermoon, giving us more and more access to darkness and Milky Way as the workshop proceeded, while still giving some stunning lighting from the waning full moon. We visited many of the breathtaking vistas in Arches: Park Avenue, Balanced Rock, The Windows, North/South Arch, Turret Arch, Double Arch, Landscape Arch, Pine Tree Arch and the coveted (and often crowded) Delicate Arch. The weather played nice—it was warmer than expected during the beginning of the workshop. And we had clear skies most nights, except for some pesky clouds here and there. But what's night photography without a little adversity, right? The students were eager to hone their skills for star point and Milky Way shots, for light panting, and for star trails and star stacking. We covered all those topics and then worked on combining them, in groups and individually. We're certainly proud of our students' accomplishments, and from what we heard at the end of the workshop, so are they. Mission accomplished! One of our favorite moments in the workshop is always the group show at the end. Everyone gets to see how they and their peers have grown during the workshop. Here is a look at their wonderful work as a video (slideshow available on the workshop page for larger views of the photos). Enjoy! Death Valley is one of the most famous, but least known of our National Parks. It’s famous for being the hottest place on Earth, for having the lowest elevation in the U.S., and of course for the colorful name that leads one to think of a dying man lost in the desert sun, crawling across the desert in search of water only to find mirages, cacti and rattlesnakes. Death Valley is not so well known simply because of the sheer scale of the park, and the incredible diversity of flora, fauna, geology and weather to be found there. Most people visit for a few days or a week, which is barely enough time to scratch the surface of this incredible wilderness in the Great Basin near the California-Nevada border. I’ve been visiting Death Valley regularly for the last six or seven years, and have taught a couple of night photography workshops there before, but still have much to learn about and see in the largest of our national parks. Using my Coast Portland focusing light on the Death Valley salt pans a couple of nights before the workshop began. Also note my Manfrotto Series 1 Traveler tripod, my Nikon D750 and Peak Design Everyday Backpack. Four sponsors in one photo, totally unplanned! See, we really do use this stuff! Photo by Chris Nicholson. Fellow instructor Chris Nicholson spent a couple of days with me a year ago during my previous Death Valley workshop, but this was our first time teaching together. We arrived a few days early to scout locations, to get acclimated and to plan our strategy for the week. We feel that those few days before a workshop spent in a park are always critical to making the experience as good as it can be for the participants. It gives us a chance to get into the groove of working together and also to match the rhythm of place itself. Of course, this little bit of extra time is our opportunity to shoot for ourselves, and we did just that. As with most of our workshops, we had a mixture of alumni and new faces, advanced photographers and novices. What was rather unusual was that we had only three women out of 15 participants. It was, however, a great group and everyone got along well and worked together to make the most of our experiences in the park. We had planned for this workshop to begin right after the full moon so that we had bright moonlight at the beginning and increasingly dark skies toward the end as our group became more confident. On the first night of the workshop, we hiked into a canyon to photograph the enormous Natural Bridge, which was a great place to start. It also worked out to be a fitting consolation prize for one of our group who had wanted to attend the Arches workshop but couldn’t sign up before it sold out! After a few hours in the canyon, we ventured out into Badwater Basin for wide-open skies with salt flats in the foreground and mountains on the horizon. Recent rains had dissolved most of the famed geometric patterns in the salt pans, but new ones had already begun to form, and we spent time seeking them out. We had planned to visit the Mesquite Sand Dunes on the second night, but the wind kicked up and made it impossible to go out to the dunes. 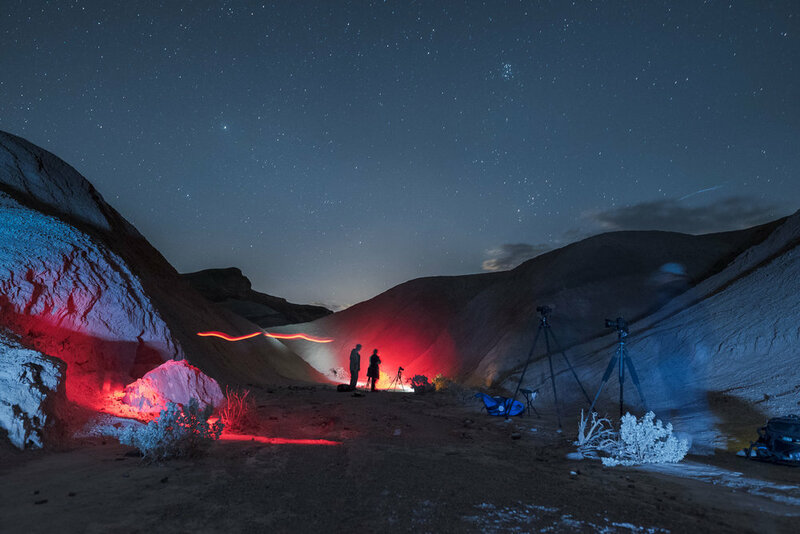 Instead, we followed the Badlands Loop trail into the canyon below Zabriskie Point, and the group worked collaboratively to great success on light painting images. In the end the change of plans worked out perfectly. Chris and I had scouted off-the-beaten-path access to the dunes, but despite that, there had still been quite a few footprints—the No. 1 enemy of the photographer working with a sandy landscape. But the wind that blew in on the second night cleaned the dunes of every single footprint and dissipated by the next morning, leaving us pristine dunes to photograph on the third night. We couldn’t help but leave a few footprints behind, but did our best to walk in each other’s tracks. On the fourth night, we traveled just outside park boundaries to Rhyolite ghost town, just across the border in Nevada. Rhyolite is always a great location for workshops, as the remaining buildings are scattered over a large area, making it easy for the group to spread out and keep out of each other’s way. After making what I think is the best workshop group photo ever (above), we broke up into small groups, and happily spent the night among the ruins. On or last day, we had our final presentations (below) and then a group lunch at the Furnace Creek Inn. 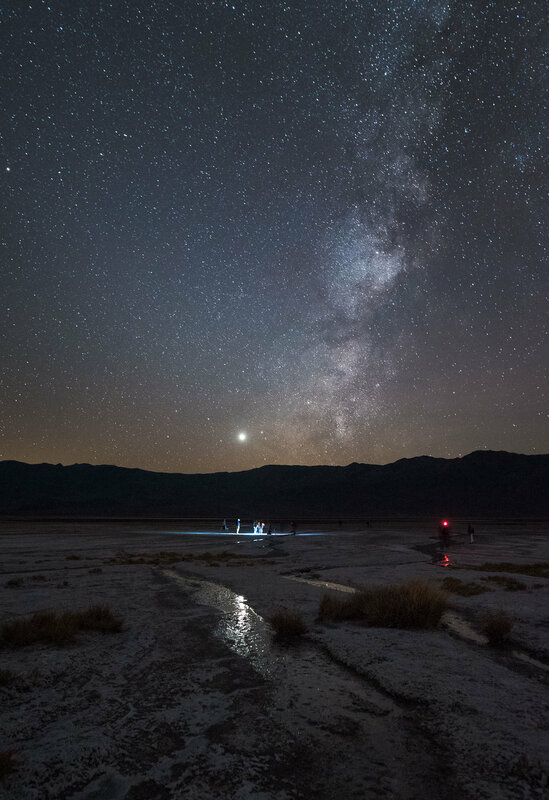 That night, we went to the flats south of Salt Creek, which was a similar location to Badwater, but with some spots of shallow water that could be framed to reflect the starry sky. By this time of the week the sky was completely dark, as there was no sign of the moon until quite late. Despite it being November, we were still able to photograph the tail of the Milky Way, which was a highlight for many in the group. Later we went to the Furnace Creek area to photograph the surrounds in the soft glow of the lights of the village reflected off of the landscape—an eerie scene that makes this one of my favorite places to photograph in the park. There are many great locations that we didn’t get to—Racetrack Playa, the charcoal kilns, Ubehebe Crater and the higher elevations in the western side of the park. Somehow, I’m sure that most of our group will find their way back to Death Valley again someday to further their explorations. 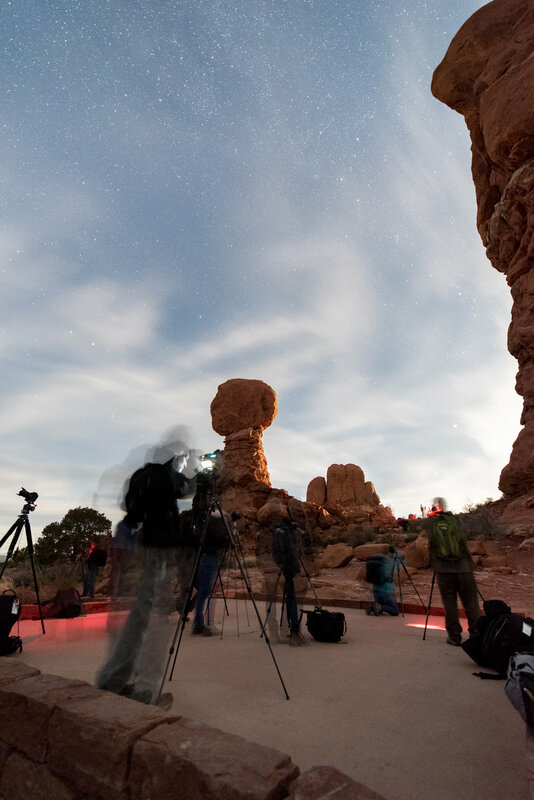 We owe a special thanks to our partners for how they helped the attendees of both workshops, supporting our mission to share and capture the beauty of national parks (at night!). Nikon sent a generous loaner package of gear for attendees to use, including D5's, D750's, D810A's and lenses ranging from the 10.5mm to the 16mm to the 20mm to the 14-24mm (all among our very favorites for night-sky work). Coast Portland generously supplied flashlights for all attendees to own and love. X-Rite supplied an i1 Display Pro to profile and calibrate our teaching laptops and projectors. Digital Silver Imaging provided a set of sample prints of NPAN instructor photos for students to view. TetherTools sent along a Case Relay System which Matt used to capture many timelapses and star stacks. And Manfrotto was along too, supporting all of the instructors' cameras. Chris using his Coast HP7R to focus on some rock formations in Death Valley's Furnace Creek area. Shooting with a Nikon F5 on his Gitzo 3541L tripodS. Matt rocking a Coast HP7R and a Peak Design Everyday Backpack 30L on the trail to Landscape Arch. Click to experience the map! In late April, we hit the road NPAN style. We chose to celebrate the National Parks Service's free entrance days for National Park Week by taking a whirlwind tour of Southern Utah. Gabe, Matt and Chris were joined by our friend Sean in Las Vegas and we hit the road in a car and on two motorcycles. Our trip led us through three national parks (including Zion, which wasn't a destination, but how could we not at least drive through?) and two national monuments. It was epic, and awe-inspiring. Our routine was great! Eat a substantial breakfast, hit the road, drive through some amazing landscapes, grab some food and head out into the park to go shooting for the late afternoon and evening (often until 2 or 3 a.m.). 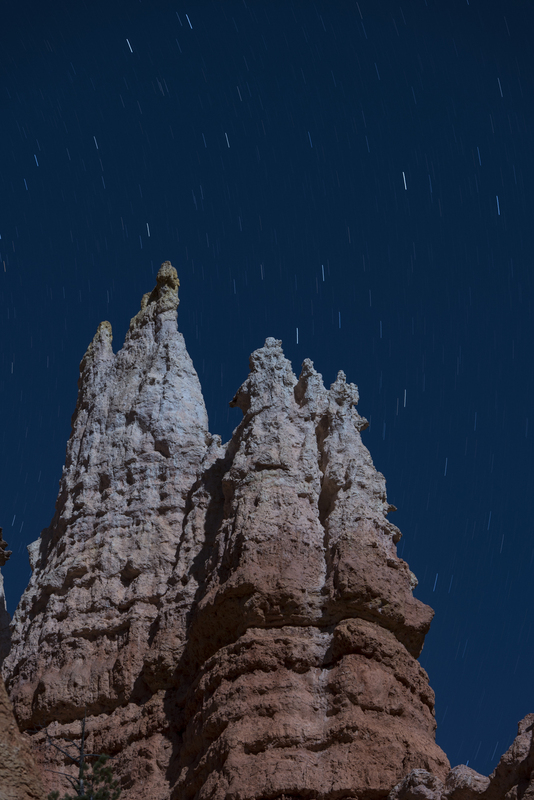 My first impression was a gasp when I viewed Bryce Canyon under a full moon. A massive canyon filled with hoodoos and trees. And gorgeous shadows. It was brutally cold, even for late April, and we withstood the wind on the canyon rim to enjoy the view and make some images. Upon descending into the canyon, the wind died, as well as my hopes for avoiding aerobic exercise for the day. ;-) What goes down, must come up! That canyon is deeeeeep and steeeeeep. Nonetheless, we hiked into the hoodoo field and I spent a lot of time playing with the relationship between eroded sandstone rock and living wood. What a gorgeous juxtaposition of colors, textures and shapes. We're fortunate the skies cooperated in a big way. Very happy with our experience there, despite hiking back up the canyon with 30+ lbs. in my backpack at altitude. Visit the Bryce Canyon Official NPS Website to plan your visit! Capitol Reef has been on my bucket list for a couple of years, so I was thrilled we were including it on our road trip. But to get there, first we drove through the big shocker of the trip: Grand Staircase-Escalante National Monument. None of us knew much about it, other than that it exists. And it's beautiful! We stopped about four or five times, mesmerized by both its size and its amazing landscapes. We didn't have time to linger, but we will be back there someday for sure. We arrived at Capitol Reef with just enough time to scout some locations in daylight, which is important in a place with such dark night skies. (Capitol Reef is one of only three national parks designated as Gold Tier by the International Dark-Sky Association.) Checking our Photo Pills app, we knew we would have one hour of utter darkness before the moon rose, so we planned to start our evening photographing star trails at Chimney Rock. From there we went to the orchards in Fruita, a remnant of the vibrant agricultural community in that area more than a century ago. The orchard proved difficult to photograph, primarily because it’s the one spot we did not scout well; instead of shooting right away, we spent 45 minutes walking around in the dark trying to imagine some compositions. We ended the night near Panorama Point. We’d scouted a nice location with a road S-curving in front of a distant mountain. We each set up a composition, and Gabe manned our intervalometers while Matt drove the car and I held a Pixelstick out the sunroof, creating light trails along the road. The creativity was fun, but the wind was brutal and cold, so as soon as we felt we nailed the shot, we packed things in for the night. On our second night in Capitol Reef, we were joined by our friend Steve Ryan, a sports photographer from New York City. He was very gracious in agreeing to drive us out to Cathedral Valley, an area filled with wonderfully photogenic rock formations accessible only by primitive roads. Unfortunately, a quick storm a few hours before departure made those roads impassable. So instead we night-hiked to The Tanks, a series of natural water holes a short (but steep) climb up from Capitol Gorge. It was a gorgeous hike (ha! see what I did there? ), a challenging (but fun) shoot, followed by a photograph-slowed hike back out of the gorge. 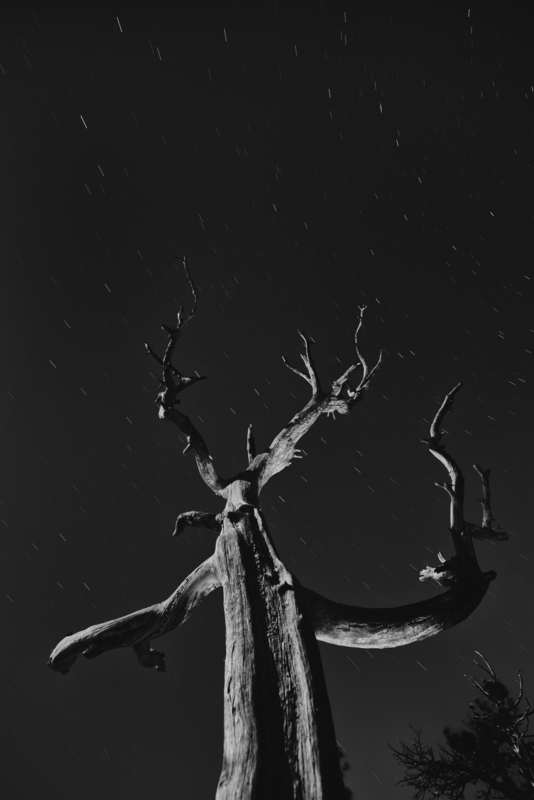 We are all eager to run a night-photography workshop in Capitol Reef some year soon. Stay tuned! Visit the Capitol Reef Official NPS Website to plan your visit! Our quest for the darkest skies leads us to some very remote locations. But the opportunity to work with no light pollution and crystal-clear skies with thousands of stars is an experience no one will forget. Natural Bridges National Monument is one of those special places. 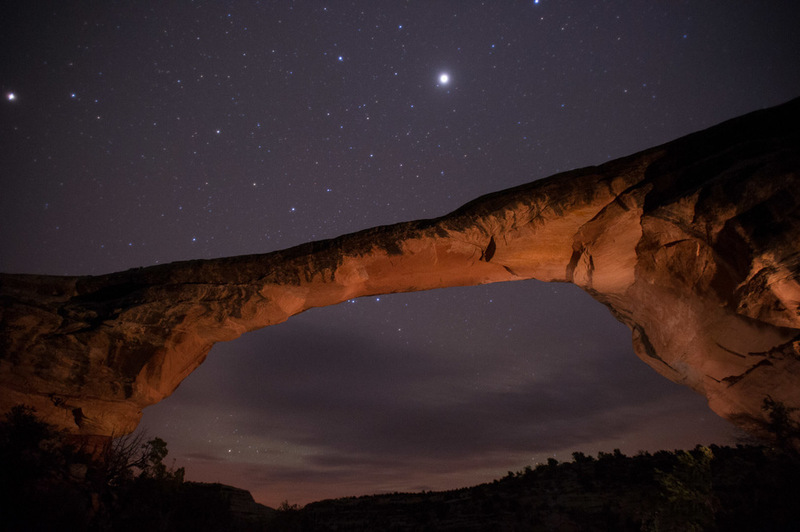 Located 40 miles from the nearest town in Southeast Utah, Natural Bridges is the oldest National Park Service site in Utah (1908) and was the first “Dark Sky Park” to be certified by the International Dark-Sky Association. We arrived a few hours before sunset and had the most amazing conversation with Ranger Ted Hodson as he shared his stories, photographs and advice for how we could make the most of our one evening. Imagine three bridges that lie at the bottom of a deep canyon, formed from an ancient river over 260 million years ago. You can do the 8-mile loop drive (in 20 minutes) and get little peeks of two of the three bridges, but the real adventure lies when you walk down the canyon and see the bridges act like windows to the stars. So that’s what we did. With overcast weather looming we chose the path to Owachoma—probably the most photographed of the three bridges. We had seen the images at the visitor center and were focused on looking for new angles. I put myself right under the bridge and Matt and Chris found an oblique angle to start brushing light under the bridge. The three of us worked together on a few more angles and group light painting until the clouds enveloped the stars. They say you can see 15,000 stars on a clear night at Natural Bridges. I stopped counting after 500. Visit the Natural Bridges Official NPS Website to plan your visit! Thanks for reading. Tell us if you participated, and how, in National Park Week. Did you #findyourpark? We'd love to hear more!